Hydrangea plants are hardy perennial shrubs that can be cultivated in several growing climates, ranging from zones 3 through 9. 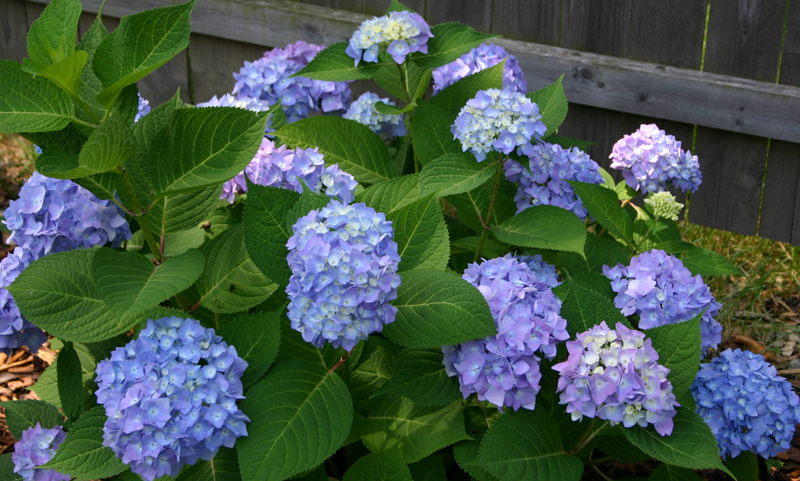 The flowers of the hydrangea bloom in summer and can last well into the fall. These are showy blossoms that come in shades of blue, pink, purple, or white. The leaves are bright green. They are one of the prettiest shrubs used to accent any garden that gets full to partial sunlight. Hydrangeas thrive well in many soil types. Some varieties will actually change bloom color, depending on the acidity, or PH, of the soil. Given adequate root space, certain varieties of hydrangeas can grow to be upwards of 6 feet in diameter and 12 feet tall. Blue hydrangeas, Pee Gee's and Oak Leaf Hydrangea, are the hardy shrubs with either ball shaped or flat cluster flowers in blues and pinks. These do well in cooler climate zones 5 through 9. Oakleaf hydrangeas, such as the Snow Queen, thrive best in climate zone 5. The flowers are deeper in color and dry to a dark burgundy, making them colorful additions to seasonal centerpieces in autumn. Panicle hydrangeas and Smooth hydrangeas, such as the PeeGee and Grandiflora, perform well in climate zone 3. These boast the cone shaped or snowball shaped blossoms in lighter colors and whites. There are also climbing vine hydrangeas and small container types. It is recommended that hydrangeas be planted in either the spring or fall in porous, moist soil. Early morning sun and late afternoon shade is ideal, but most will bloom with partial sun. You should leave at least 3 feet between plants. After planting make sure you water generously. Hydrangeas do best when the soil around the roots is healthy and clean, meaning you can add a small amount of organic based plant food once a year and protect the soil with a rich compost or mulch in winter. You can prune some variety of hydrangeas in the late fall or early winter, after they have stopped flowering, by cutting back the dead wood stems to encourage new growth. It will likely take 2 seasons to see new flowers where you have pruned. Hydrangeas do not need to be shaped. Hydrangeas are truly beautiful additions to gardens and lawn perimeters. There are societies and clubs dedicated entirely to this pretty and viable plant species. There are some very good publications written on the subject that are worth checking out at your local library or ordering online. Hydrangeas for American Gardens by Professor Michael Dirr is one of the more contemporary published works on hydrangeas with photographs and in-depth research and descriptions. Hydrangeas: A Gardener’s Guide co-written by British authors Toni Lawson-Hall and Brian Rothera has beautiful photographs and easy to read descriptions for the home gardener.